Audrey Hepburn will excuse me but owning a good pair of jeans is as important (if not more important) that having a little black dress. 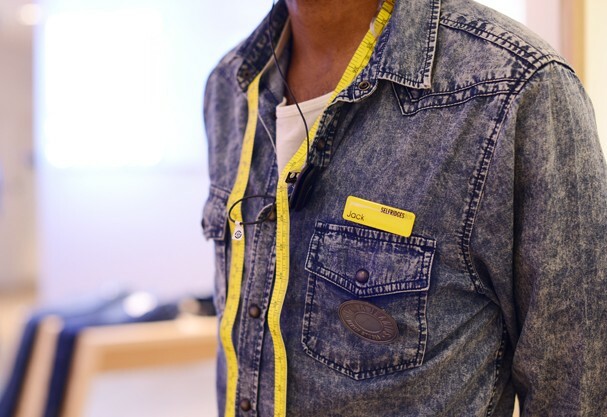 After learning through internal research, that the denim is the most wanted material among the clientele (like we didn't already know that), +Selfridges created the largest department of its kind in the world! 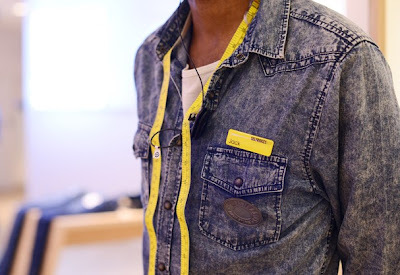 It's called Denim Studio, which has just opened on the third floor of the famous luxury department store in London. In the 2320 square meters - think of two Olympic swimming pools - more than 60 brands and 11,000 pairs of jeans are available to buyers of all tastes, shapes and budgets. If there is a denim in the world that you're looking for, it's definitely there: low bugdet brands such as Primark, the most classic Levi's and Lee jeans, jeans masters like Citizens of Humanity and Paige, and the premium brands like Christopher Kane and Alexander McQueen, the jeans in the Denim Studio can cost between 11£ and 11.000£! The last one, from the brand J.Brand, has two diamonds stones of 2 carats each. However, the most interesting of the Denim Studio is not the jeans with diamonds or other glod-plated buttons. What makes it a really special place is the variety of services, the new concept of buying high-tech, and new brands that promise to make buying a simple pair of jeans an unforgettable experience. In case of emergency, just press the button! With a team of 30 people prepared to help, you're sure to find your jeans. Serve yourself with some coconut water and enter one of the 18 dressing rooms with your chosen pairs. It did not went as expected? No problem, just push the button inside the dressing room, that turns on a light and pretty soon someone comes bringing more models and sizes. With no additional cost, a personal stylist can be of great help if you are lost with so many choices, sizes and cuts. Enter the lounge, sit on the spacious couch and just tell them what you need. Give them a few minutes and then just go back to try on the pieces with no obligation to buy. Just the name is already genius (see what we did there?). But it is more than just a name, is a giant tablet to help find your ideal pair of jeans This tablet is a huge interactive library with everything you could imagine about jeans. You may want to consult the body guide to understand what jeans suits you best, look for a particular piece or seek inspiration. It is not always that a pair of jeans fits you perfectly - sometimes just a little adjustment there, a small hem there, and voila! But it is not very pleasant to think about leaving your jeans for days in a atelier. For this, the Denim Tailor space is there. With a variety of services, your jeans will be ready in a maximum of two hours. If you are one of those who likes to be unique when it comes to fashion, visit the Denim Studio on Fridays and Saturdays and find at your disposal a seamstresses that will customize your piece in the moment, quickly and for free. There is also the option of The Laundry Room brand, which suggests that you choose the pocket that will be in yout jeans. If you love vintage denim, you will find yourself in the paradise in front of the scale of the brand East and Thirft Store. The kilo costs 25£ and there are not only pants but also overalls, vests, shorts, everything you can imagine. As a pair of jeans weighs about 400 grams, the idea of buying jeans like this is very interesting. If you think supermodels are very lucky because all her clothes fit well, you're wrong. They struggle to find a pair of jeans that actually look like pants instead of shorts. In the Denim Studio you can find the brand Frame, famous for making pants for those who have long legs. In July and August, a series of special collaborations between Selfridges and designer brands such as Givenchy and Stella McCartney, will invade Denim Studio. The celebration Denim Lovers will bring a number of limited edition products in jeanswear. So, whether you want to sculp your tights, flatter your hips or create a seamless silhouette, Selfridges has the service for you.